New Honda Civic review | What Car? What is it? This is the ninth generation of Honda's Civic hatchback. It shares its basic platform with the outgoing model, but aims to offer extra technology, better efficiency, improved ride and handling and higher quality. Honda says it listened to current Civic owners, too; keeping the features they liked and improving or removing the ones they didn't. 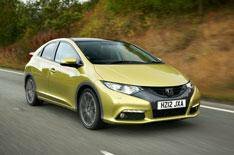 The new Civic will initially be available with a choice of 1.4- or 1.8-litre petrol engines, or a 2.2-litre diesel. These are all more powerful and cleaner than the engines they replace, with the diesel showing the most dramatic improvements: power is up from 138bhp to 148, while CO2 emissions have dropped from 135g/km to just 110. A smaller diesel (probably a 1.6) that's expected to dip below the psychologically and financially important 100g/km barrier will follow in late 2012. What's it like to drive? The new Civic is a stable motorway cruiser, plus it grips strongly in bends and resists body roll well. Unfortunately, it never inspires the confidence it should because the steering is overly light and devoid of feel. Comfort isn't great, either, because the Civic shudders over potholes. The ride does improve with speed, but it always remains pattery and unsettled. Ours was an early car, however. Honda has said that the suspension will be tweaked before the production version goes on sale. Our car had the 2.2 diesel engine, and this is so strong and flexible that a slight squeeze of the accelerator is usually all that's needed for faster progress. Its just a pity it clatters at idle and becomes coarse under even gentle acceleration. The Civic also generates a lot of road noise over most surfaces and at all speeds. What's it like inside? The dashboard is more conventional and easier to use than the outgoing Civic's. However, there are still problems; cars with satellite-navigation get a fiddly touch-screen infotainment system, plus the speedo can be obscured by the top of the steering wheel and there are several brightly coloured displays that reflect in the windscreen at night. Rear visibility could also be better because a spoiler cuts across the rear screen, although this is narrower than the spoiler on the outgoing car. The fact that Honda now fits a windscreen wiper and covers the whole screen with heating elements, not just the top part, improves things further. Unfortunately, the Civics thick rear pillars mean over-the shoulder vision is awful. Hondas attempts to improve interior quality have been more successful. The upper part of the dash is dense and soft to the touch, and while the lower plastics are nowhere near as classy as the ones in a Volkswagen Golf, build quality seems solid enough. There's plenty of legroom, whether you're sitting in the front or the rear, but anyone over about 5ft 10 will wish there was more headroom (our range-topping EX GT car wasn't helped by its standard panoramic glass roof). Fortunately, luggage space is far more impressive. The boot has a 470-litre capacity, 120 litres up on the Golf's. What's more, the outgoing Civic's clever folding rear seats have been retained: the bases automatically cantilever down when you lower the backrests to leave a flat load floor, or you can flip the bases up like cinema seats to create a deep storage space behind the front seats. Even entry-level SE-spec Civics come with alloy wheels, climate control and a USB socket, but we'd be tempted to upgrade to the ES model, which adds cruise control, Bluetooth, a revering camera and automatic lights and wipers. Should I buy one? The new Civic isnt without appeal. Its rear seats are very clever, plus the diesel model that we drove combines strong performance with low running costs. Sadly, the flawed ergonomics and poor ride and refinement mean the Civic falls a long way short of the standards set by the Golf and Ford Focus. If space isn't a high priority, the new BMW 1 Series also has a lot more going for it.